A couple weeks ago my parents left for a 3 month vacation to their homeland of Greece.I decided as a gift I would renovate their home here in Australia.I started work on it a couple of days ago and today I was moving some furniture around.Behind a wardrobe in their bedroom (which had not been moved in over 30 years) were these two jigsaw puzzles.These two pieces are hugely, HUGELY significant to me in that they are the very first two pieces of Star Wars memorabilia my father bought for me at the age of 7. These even predate the first two action figures I ever bought (also R2, 3po & Chewie - which I still own)!! !My father took me to my first screening of Star Wars and then bought these jigsaws straight after the movie. When we came home we put them together and I went to sleep. When I woke the next morning, my jigsaws were stuck with glue on two pieces of cardboard and hanging on my bedroom wall...I was furious...but today I'm very thankful he did that. 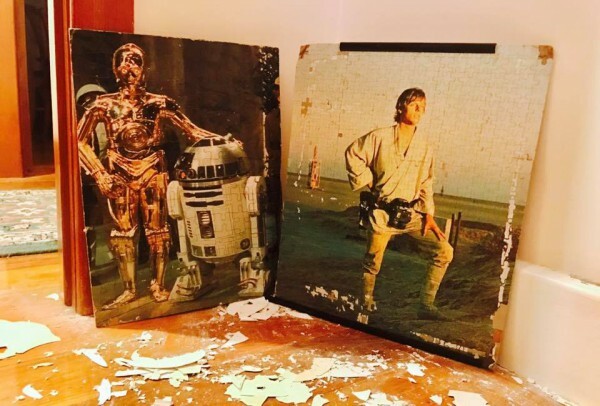 Had he not, these would have been vacuumed up, dropped behind the couch, eaten by the dog or 101 other ways to have been lost forever.So here are the very first two pieces that introduced me to the world of Star Wars 40 years ago!! !Thanks Dad. MTFBWY always!